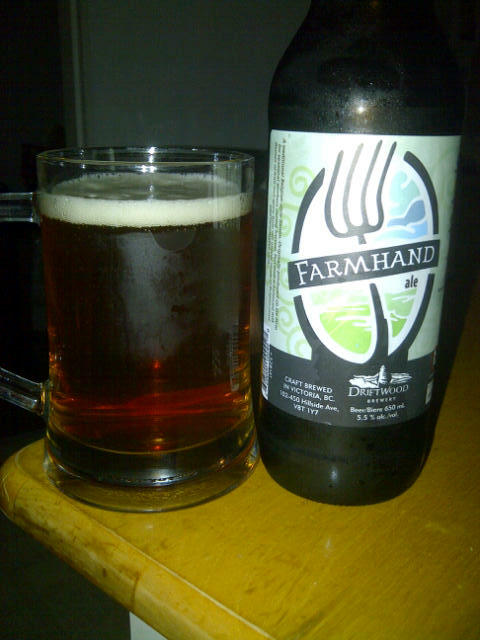 From Driftwood Brewing in Victoria BC comes the “Farmhand Ale”. Pouring a deep golden with a nice white head you know you are in for a treat. The beer smells of citrus and yeast with a heavy pepper presence. The taste of this beer is great with a heavy pepper taste that almost overpowers the hops bitterness while still alowing the citrus flavor to shine. This beer comes in at 5.5% alcohol. This entry was posted in Ale and tagged ale, bc, bitter, bitterness, canada, citrus, hops, pepper, tasty, victoria, yeast.